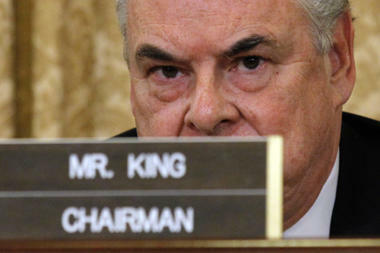 As recently as the 2010 elections, Peter King’s political opponent in the Congressional race, called King “A Terrorist Collaborator“, citing his support for the IRA. It is a shameful commentary on the electorate, that King still won. So eager is Peter King, to target and persecute Muslims, that back in December of 2009, he said, “while the overwhelming majority of Muslims are outstanding people, on the other hand 100% of the Islamic terrorists are Muslims.”. This man is now so worried about “terrorism”, that he wants to eradicate all Muslims…er, “Trrrrrsts“. The actual fact is that we Muslims are the most powerless minority in the US and Muslims have avoided participating in elections or campaigns, which is why Muslims don’t exist, as far as politicians are concerned. It is because Muslims don’t exist, that there are no negative consequences to bashing Islam or Muslims; on the contrary, people who bash Islam and Muslims are guaranteed fame and fortune. Talk-show hosts can be assured of increased following and higher ratings, politicians can be assured of greater funding and more points in elections, generals like Boykin, can be promoted (Undersecretary of Defense), law-enforcement agencies can get more funding and powerful toys like armored personnel carriers and people who were complete nobodies, can become nationally respected…all because they promote fear and hate against Islam and Muslims. “Muslims aren’t American when it comes to War“. Good one! When are we “American”? Assuming of course, that King can define what an “American” is. “There are too many mosques in this country“. So how many ARE enough? About half the number permitted for Catholics? a THIRD the number permitted for Protestants?…maybe 60% permitted for Jews? “Over 80 percent of mosques in this country are controlled by radical Imams“. I suppose this one is true if one defines a “radical” imam who believes in the Quran…which would be all of them. I have prayed at 18-20 mosques in the Puget Sound area and many in Pakistan and I can tell King with certainty, that I have never come across a “radical” imam i.e., one who preaches hate and violence. This is not to say there aren’t any, of course there are; just as many as we would find among Christians, Jews, Hindus and yes, even Buddhists. If King were truly interested in an objective, fact-finding inquiry, one would imagine that he would have called for witnesses from among the very Muslims he was investigating…even the late Senator McCarthy called his suspects to stand witness in his hearings; King is too smart for that. Instead, he was planning to call a Muslim physician Zuhdi Jasser from Phoenix AZ, as his main “devout Muslim” witness. According to his personal website, Zuhdi Jasser is a Syrian-born. He starred in the vile hate-Islam video called “The Third Jihad“, as the narrator. Obviously, Jasser has discovered the glory of feeding the hate-Islam beasts. Great! Indians had their Scouts working for the White Man, the Jews had Jew hunters and Judenrat working for Hitler and Muslims have “devout Muslims” like Jasser, working for the Ultra-patriotic bigots. One of King’s main arguments for this “Hearing” is that Muslims do not cooperate with law-enforcement agencies. One would imagine that he would want to make that point abundantly clear by having law-enforcement officers as witnesses, who would support his argument. Unfortunately for him, he could not find any officers who agreed with his thesis…but there were LOTS of officers, sheriffs and chiefs, who disagreed with him and strongly so. No problem! King simply did not invite any law enforcement folks as witnesses. There were lots of other witnesses at the King “Hearings”, one of whom was Democratic Representative Keith Ellison of Minnesota who gave a tearful account of a Muslim first-responder who lost his life while trying to rescue victims of one of the 9-11 Twin Towers; Ellison was trying to prove that Muslims are indeed, decent, honest Americans. I may be wrong, but I thought Ellison was crying because he was frustrated at this witch-hunt disguised as a security concern and felt helpless. Being one of only two Muslims in Congress, I imagine he did not feel confident enough to tear a strip off of King’s arrogant hide and tell him in clear terms, how King was turning this great country into an ultra-nationalist, extremist state. In effect, Rep. Thompson was agreeing that if Muslims are ticked off, they will become suicide-bombers…way to support us! It is bad enough that King gets his day of glory by bashing Muslims, but what was the rest of America doing? The Obama White House sat in complete silence; obviously, it had more important things to worry about, than the country turning to fascism. A few voices rose in the form of a letter signed by a handful of Representatives, no Senator could be bothered to speak out against an egregious insult to Muslims as well as to the entire nation. The American on the street in general, wasn’t bothered; it did not affect taxes, no money out if the individual pocket and gas was still affordable, what me worry? There were many small-scale voices across America, people of different faiths grouped together to condemn King’s “hearing”, some got good media coverage while others got less. I called a press conference with a 24-hour notice and decided to hold it at the Islamic School of Seattle. It was gratifying to witness the many leaders who took time out of their busy commitments to show up and make a statement against bigotry and the King “hearings”. At the end of the day, what can we really do? The only way to stop people like King and the only way to help our political leaders believe that speaking out against bigotry is a good thing, is for Muslims to get involved in the political workings of this country. We must set aside our own sectarian differences…and there are many… and we must start off by combining our voting power; we HAVE to get our votes together as blocs so that politicians can understand that our vote is crucial to their survival, before they understand that we exist and we are worthy of their attention. It does not take many votes to do this, only about 4000 votes in any single state, can wield enough power to keep a caring politician or dump an indifferent one.